Spray 5- to 6-quart oval slow cooker (with removable insert) with cooking spray. Unroll crescent dough; press evenly into bottom of insert and at least 1 inch up sides, working dough as needed to ensure even thickness all around. 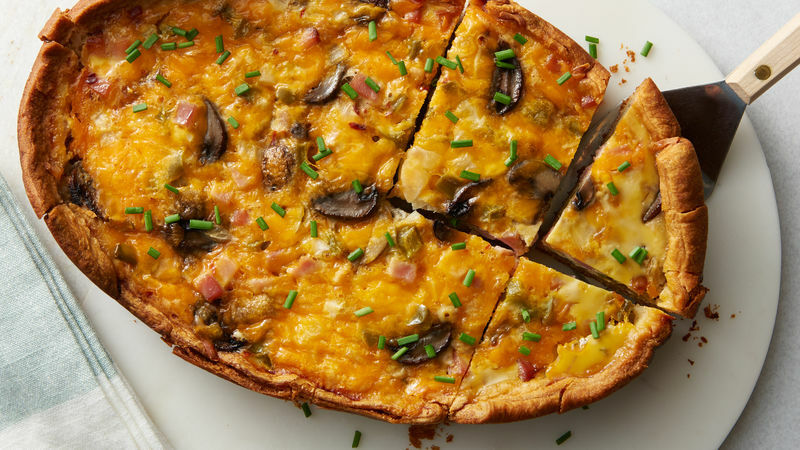 In medium bowl, mix mushrooms, bell pepper, onion, ham and 1/2 cup of the cheese. Spread half of the mixture on top of crescent dough. In 4-cup glass measuring cup, beat eggs, salt and pepper flakes until well mixed. Carefully pour half of the beaten eggs on top of ham and vegetable mixture, making sure egg stays inside crescent-lined bottom. Add remaining ham and vegetable mixture; pour remaining beaten eggs on top. With spatula, gently press filling mixture into beaten eggs. Top with remaining 1/2 cup cheese. Cover top of insert with large kitchen towel folded in half. Place lid on top of towel. (This will prevent condensation from dripping onto crescent during cooking.) Cook on Low heat setting 1 1/2 hours. Leaving cover on, rotate insert 180 degrees, and continue cooking 1 to 1 1/2 hours or until eggs are set and crescent is deep golden brown around edges. Let stand 10 minutes before cutting. To serve, cut into pieces; garnish with chives. Crescent bottom will get deep golden brown. We like to rotate the insert halfway through cooking to ensure a more consistent browning. Cut and serve directly from the slow cooker to keep warm.